Freezing foods is something you can learn in stages. There are 3 ways to save money with your freezer. First, buy low, freeze and save. It’s simple. You need a freezer, and you can get a brand new one fairly inexpensively. I rebated until I purchased mine. I have the biggest chest freezer, and I paid for it with liquor rebates back in 2007. Get an energy efficient one. Old freezers will cost you more money on energy than just buying a new one. When you see a good deal on meat, cheese, dairy products, and frozen pizza, all you need to do is stock up. I organize the freezer with compartments (see another blog post about freezer organization). Keep it full! It costs less to run a full freezer than a half full freezer. This week the Bakery has Sweet Bread on sale for $1.49. Pick some up and pop in your freezer. It’s the best price to make your own garlic bread, or cheesy bread, or just have a nice sweet bread with a meal. You can also pick up Roman Meal with a combo of the printable coupon to save $1 from teh MF, and the Treasure Hunt store coupon to save another $.50. It's a stock up deal! Other items I often freeze on a sale include: Whole Chicken, at $.88 lb you can’t go wrong, Rhodes Bread dough, pizza, frozen berries, Old Orchard juice concentrates, King’s Hawaiian, bacon, and ice cream. The second way to save is by freezer canning. It’s a relatively new concept. You put up produce the same way you would can, except you use freezer containers that are designed for longer term freezer storage. I like it for salsa, and applesauce. It’s quick and easy and thaws well. Having fresh high quality stock is something that add s a lot of flavor to your cooking. I also freeze any extra chicken, or turkey stock when I have the chance. 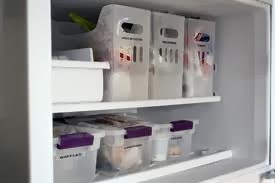 Freeze in small containers then move cubes to freezer bags. Any winter soup or casserole is better with a good high quality broth. It’s cheap and easy. Glad, Ziploc, and Ball all make stackable freezer containers. The Ball ones are supposed to keep your canned creations better longer, I have yet to get the salsa to last that long! Look for coupons before stocking up on containers, all brands will issue coupons though the year. The third way to use your freezer to save money is by maximizing your make ahead meals. I love this! I’ve just recently (4 years) gotten into freeze ahead meal prep. Why come home and freeze a pack of chicken breasts when you’ll have to thaw it and decide what to do with it later? This new freezing method saves you time in addition to money. 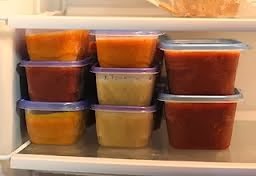 I love freezing vegetable mixes, or rice dishes, or marinated meats that can thaw and go directly in the oven, crockpot or on the grill. Pinterest has near a 1000 Make ahead meals, and I’ve pinned about 500 so you can easily find them. Rice has been a life changer for me. I never wanted to cook the rice, and make the stirfry all in the same evening. When I found out I can cook rice and whip up several batches and freeze them I have been able to incorporate more rice in my meals. Since I have rice on hand, I have started making more side dishes like Spanish rice, spicy peppers and rice, and even cheesy rice. In the past we’ve been boxed meal rice consumers. The pre made rice packs have given me options.